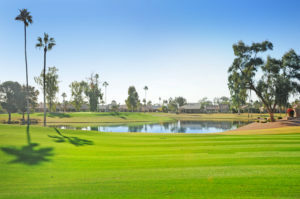 If you want to enjoy all the amenities the active adult community Sun Lakes has to offer, check out our new listing at 10101 E. Cedar Waxwing Dr. in the Oakwood Country Club. 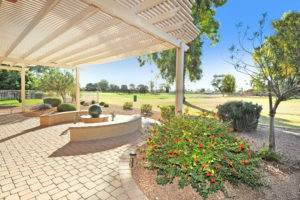 Enjoy waterfront and golf course views! This gorgeous, Lexia includes 3 bedrooms and 2.5 baths with main floor living. And if you love to entertain, guests will enjoy their own private retreat with 2 bedrooms and a bath on the second level. Impress visitors with a stunning entry and spiral staircase. This ushers you into the formal living/dining room and the spacious kitchen that overlooks the family room. You can entertain and cook in your spacious kitchen with large picture windows and views of the the Palms Golf Course and lake. Here, you’ll find neutral tile flooring, an island, granite counters, cherrywood cabinets, RO, and soft water. The HVAC is new in 2015. And if you want to relax at the end of the day, you’re in for a treat! The master suite on the main floor features a bay window with views, two walk-in closets, split dual vanities, granite counters, cherrywood cabinets, and a glass-block walk-in tiled shower. Plus, there is a 3 car garage with workbench and storage cabinets and a covered exterior patio to enjoy the great outdoors. And did we mention the amenities of Oakwood Country Club? Enjoy golf, tennis, pickle ball, a heated pool and spa, a workout facility, a clubhouse and rec room, walking/bike paths, lakes, card clubs, restaurants, bars, concerts, a gated community with an on site guard and Concierge, and so much more! This is a must see home to enjoy the active adult community Sun Lakes. See the video here and all of the details here. 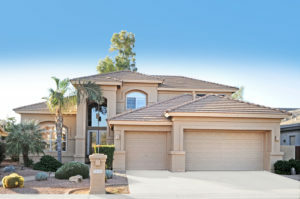 And to schedule your walk-through and to learn more, please call us directly at (480) 440-0849.